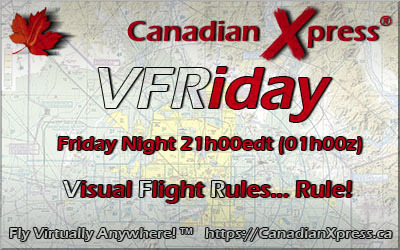 VFRiday is our informal VFR event where this Friday at Friday night at 21h00edt (Saturday 01h00z), all pilots no matter what your flying experience are invited to join us on the VATSIM network. Tonight, we head cross the pond and start at London City (EGLC) and head north to clear Heathrow airspace over to Elstree (EGTR) and Booker (EGTB) before continuing south to the home of the best airshow in the world Fanborough (EGLF) then on to Shoreham (EGKA) and then on to our final destination Bembridge (EGHJ). Click here to download FSX, P3D & XPL flight plans that includes all the airports for this week's event. Every pilot that flies 26 Canadian Xpress® VFRiday events will receive the Canadian Xpress® VFRiday Award that will appear in their Pilot Details section of the Pilot Roster. To view the current statistics for the Canadian Xpress® VFRiday Award, click the Statistics link that is available via the Operations menu. Do you want to participate in VFRiday but you are not sure where to start? The VFRiday Tutorial is available by clicking the How to Fly VFRiday link that is available via the Training menu. On-line training is also available by selecting the How to Fly VFRiday course and completing an on-line training request. Whether you fly Direct, VOR to VOR or with your GPS, you will discover that flying VFR is a lot of fun and the scenery is spectacular! So choose your favorite Canadian Xpress® prop aircraft and join us this Friday night on the Canadian Xpress® TeamSpeak3 Server for a lot of fun!